The House Judiciary Constitution, Civil Rights, and Civil Liberties Subcommittee passed a resolution, with a 6-4 vote, authorizing a subpoena to former Ohio Secretary of State Kenneth Blackwell for testimony about the 2004 election. On January 29, Judiciary Committee Chairman John Conyers (D-MI) and Subcommittee Chairman Jerrold Nadler (D-NY) wrote a letter to Blackwell to "explore the state of voting rights and the allocation of resources to end voter suppression and voter fraud," but he has refused to appear voluntarily. The Associated Press quoted Conyers; "Mr. Ken Blackwell, wherever you are in North America today, please know that we are not sending the gendarme for you this moment," said Conyers. "I do not like to issue subpoenas. ... The only problem is we can never reach him." 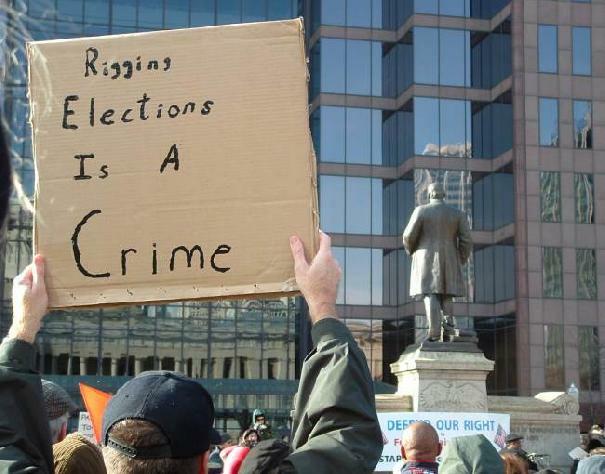 Republicans stole the 2004 presidential race in Ohio. join the fight for democracy’s most fundamental right. -- Robert F. Kennedy, Jr.
ballots, or after their arrival at a central location.